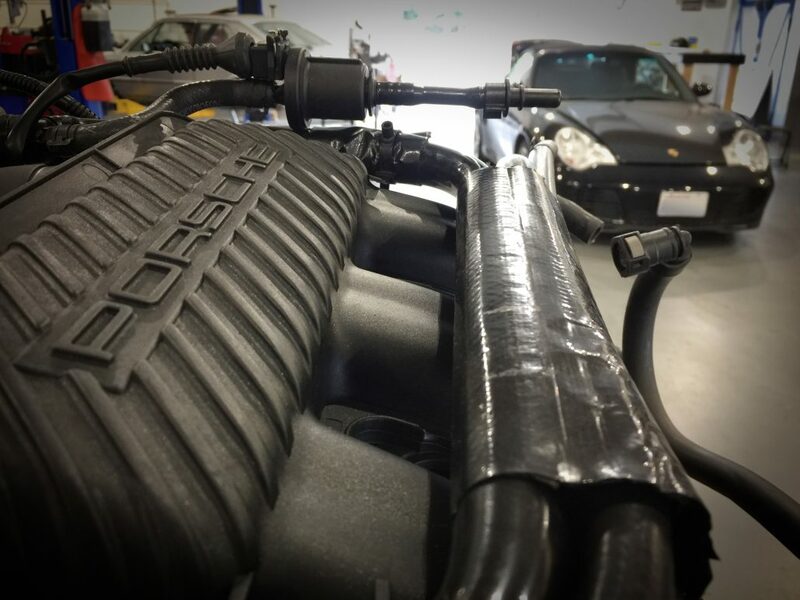 Today we are starting the install on this freshly rebuilt 2004 Porsche 911 Carrera 4s Cabriolet 3.6L N52 engine. The engine was rebuilt from the bottom up including new rod bearings, rebuilt heads and IMS bearings. The install is expected to take a little over one day and should be rolling mid week sometime. At Meister Werks in Renton, WA, 1 block south of The Renton Landing on Park Ave N.
The Porsche 996 is the internal designation for the Porsche 911 model manufactured with first model year 1998 and last 2004. It was replaced by the Type 997 in model year 2005. Development was shared with its smaller brother, the roadster-only Boxster which appeared around the same time, including the front suspension, much of the interior, and the engine, all of which were enlarged for the 996. However the multi-link rear suspension, derived from the preceding 993, was different. At its debut, the 996 featured the most significant change from the classic 911 series: a water-cooled engine replacing the previously air-cooled engine (a change that Porsche’s parent, Volkswagen, would also make when it introduced the New Beetle a year later, in 1998). Progressively stringent emissions and noise regulations, environmental concerns, a higher expectation for refinement and a high-performance 4 valve per cylinder engine made the switch necessary. Other major changes include a completely new platform having a sleeker body with a more raked windshield, and re-designed interior. The 996 Model year featured a 3.4L engine producing 296 bhp. The 2000 and 2001 model years received a slight increase in horsepower to 300 bhp while retaining the same figures for torque produced. In addition, Porsche made many changes to the 3.4-liter unit over its production lifespan, so the last of these 3.4L engines (made in 2001) have improved reliability. The 2002+ cars received a 3.6L engine which provided an extra 15 bhp (11 kW) of power (taking output to 315 bhp or 320 PS) and an additional 15 lb·ft (20 N·m) of torque (increasing from 258 to 273 lb·ft). The inclusion of Variocam Plus (as opposed to Variocam on the earlier 996) improved power delivery through the rpm range. The headlights on the 996 Carrera also adopted the turbo headlights of the MK1 iteration. Seat belt pretensioners were added. In 2000, the Tiptronic transmission was modified to allow it to enter manual mode by clicking buttons on the steering wheel. Updates also included a revised front bumper to decrease front end lift, and the addition of a glove box. The second generation 996 gained 25 kg (55 lb) in the facelift. Zach is welding two cracks in these Rotiform wheels. Unfortunately they do not make a early casting of this wheel any more so the only real option was a repair. We can also refurbish all of your wheels and fix curb rash as well. 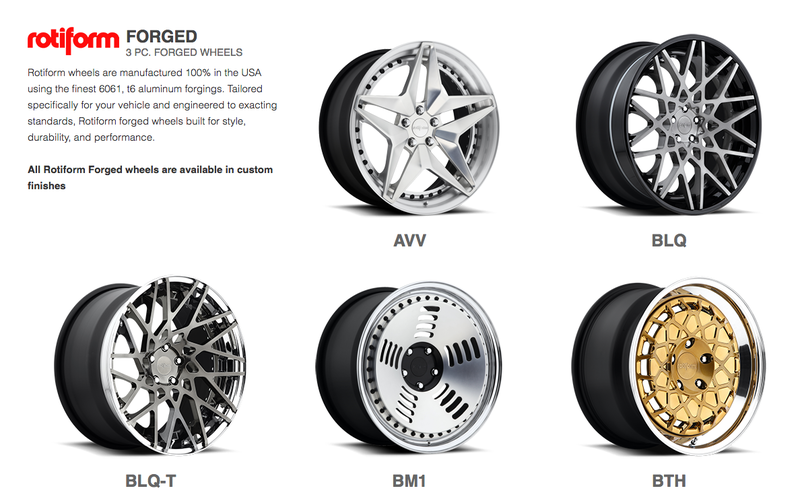 Rotiform designs and builds the finest cast and custom forged wheels for your automobile. Focused on style, strength, and aggressive fitment, the are the ultimate wheel. These forged wheels are manufactured 100% in the USA using the finest 6061, t6 aluminum forgings. Tailored specifically for your vehicle and engineered to exacting standards, these forged wheels built for style, durability, and performance. Zach staying organized while doing a Audi A4 Quattro 1.8 T head gasket the other day – at Meister Werks European & Import Renton, WA 1 block south from The Renton Landing. It must be BMW 7 series month. One of our customers brought his in his new 745Li purchase for some much needed service. Brake flush, coolant flush & check engine light diagnostic. After a thorough investigation, we found that the codes were there from the previous owner and there was nothing to be worried about. The coolant system is responsible for combating the heat produced by your BMW engine to help keep everything under the hood from getting too hot. If this system isn’t working as it should, you run the risk of overheating, severely damaging your engine, evening causing it to fail and you to be stuck on the side of the road. Obviously, preventing your BMW from reaching this point is ideal, for both your vehicle and your wallet. 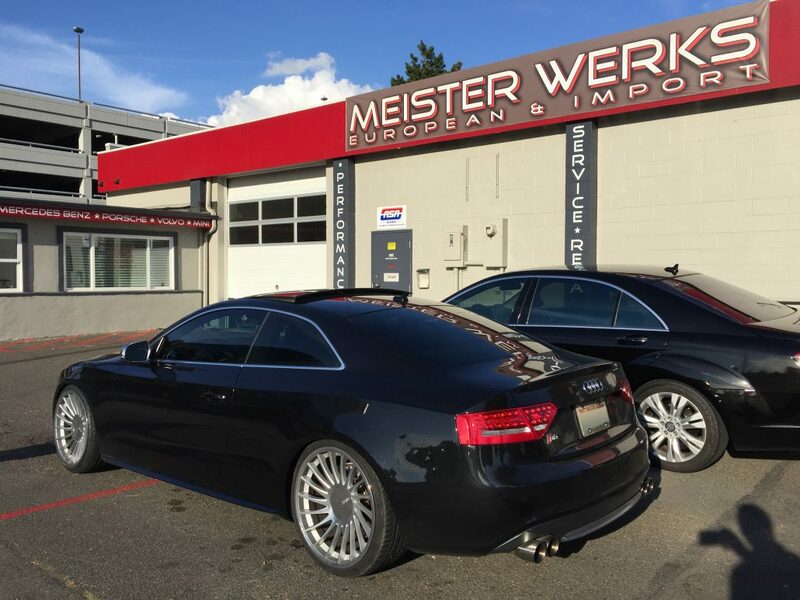 Meister Werks European & Import in Renton, WA includes a coolant check as a part of our standard 30 Point Inspection, and you may see a cooling system flush as a part of your BMW Preventative Scheduled Maintenance. If you need a coolant flush, our service staff will remove the coolant from the radiator and replace it with genuine BMW recommended engine coolant. It’s possible that if you catch the problem early, your BMW may not need a full coolant flush, but simply to have the coolant refilled. Because the possibility of severe burning and scalding exists while working with your engine’s cooling system, it’s important that you don’t remove your radiator cap unless your BMW engine is completely cooled. If in doubt, leave it to our experienced service technicians. 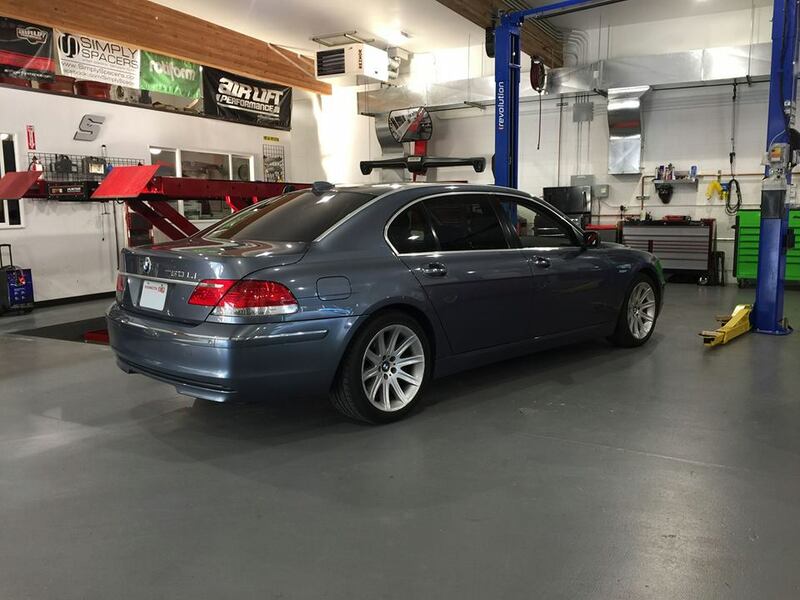 When you bring your new or pre-owned BMW into Meister Werks European & Import in Renton, WA, we will include a check of your cooling system and engine coolant as a part of our multi-point inspection at no cost. If you do need to have the coolant flushed in your BMW, our service staff will work with you to make sure you can take advantage of any coolant flush specials we may be offering. This is a prime example of what the wrong antifreeze in your car will do. The triangular shaped ducts are for coolant to run through your engine. As you can see it is extremely corroded and this one specifically is completely clogged. This ended up warping the head due to lack of cooling to this cylinder. The bottom right photo is what it should look like. Using the correct coolant /antifreeze in your car seems like a frivolous and unnecessary thing to worry about. However in most European cars this is not the case. You must use the correct type in your vehicle or else damage could occur over time. Putting the wrong brand in can lead to component failure such as clogged radiator / heater core, water pump failure and blockages in the cylinder head and engine block. As you can see from above the wrong coolant was used in this engine and lack of coolant flushes over time will result in this kind of damage. 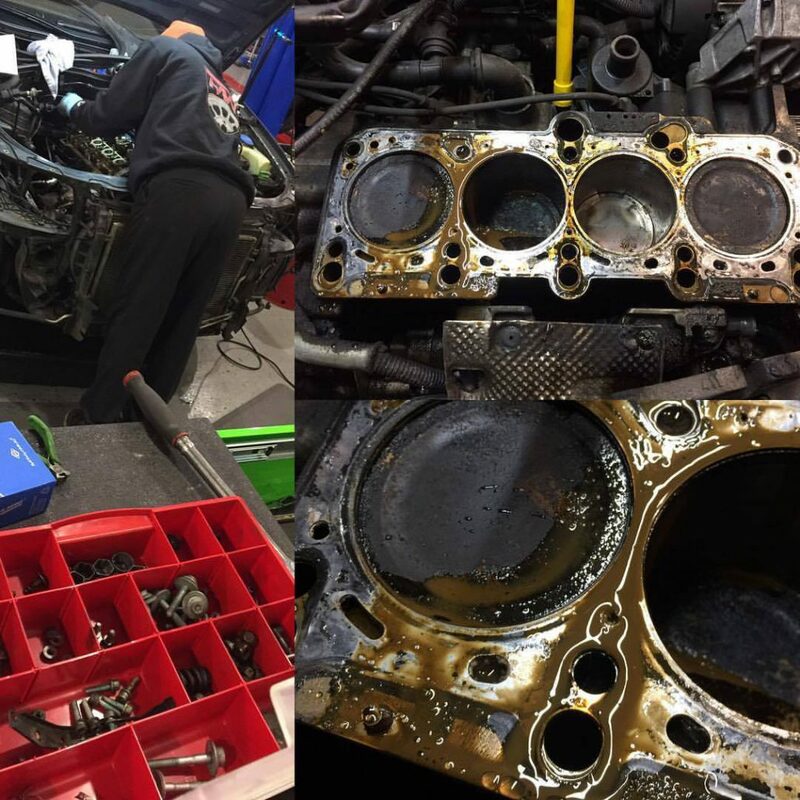 In this instance, it completely clogged the coolant ports that flow into the cylinder head causing the head gasket to fail and warping the head. 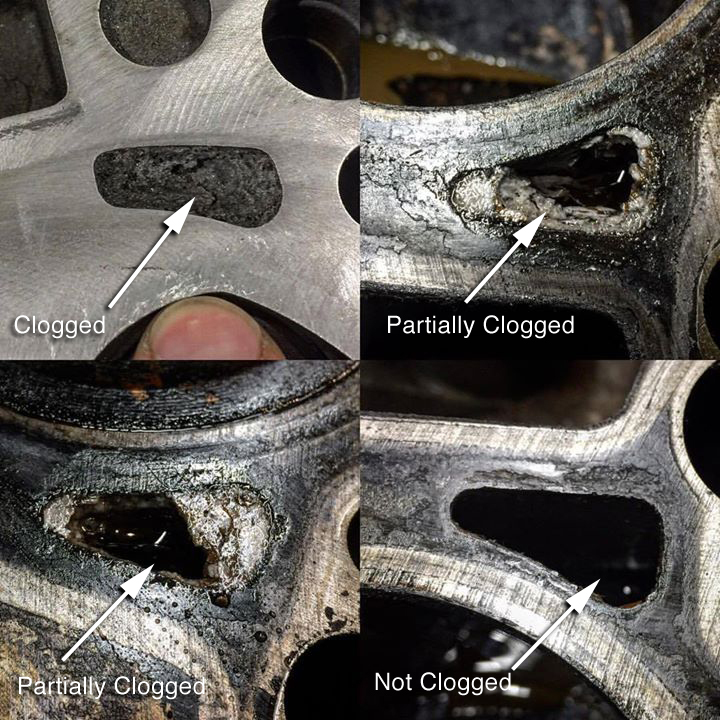 A simple cooling system flush at Meister Werks every 50k would have solved this problem. Also using green prestone or over the counter products you find at the gas station is the wrong antifreeze. Specifically this car needs G13 or pink antifreeze. VWs and Porsches need the same thing. BMW uses proprietary blue antifreeze, early VWs use Blue G12 and some Mercedes use a special yellow antifreeze / coolant. If you have any question about the type you need in your car, feel free to E-mail or call us at 425-254-0627 and we can suggest the correct type for your vehicle. 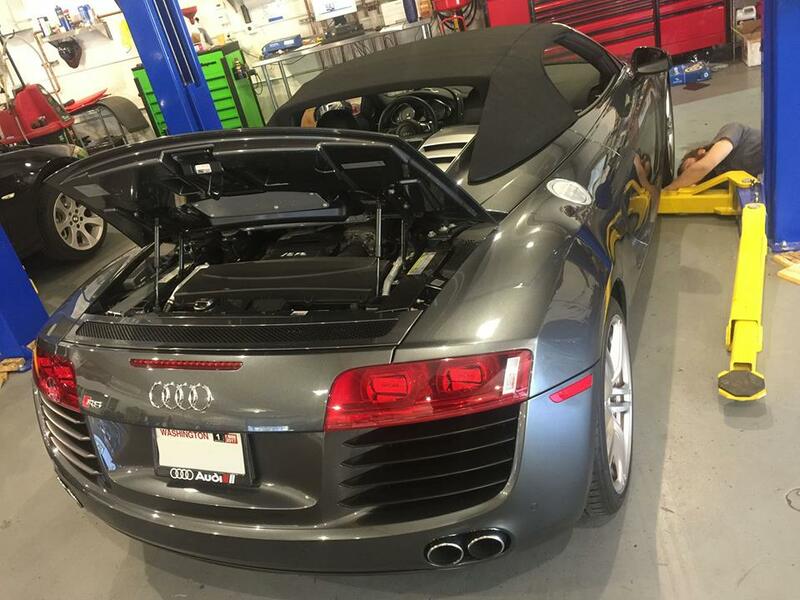 Switchpath Installation of the Audi R8 Spider AWE Tuning Switchpath Exhaust. Exhaust example sounds of before and after the install, as well as open pipes and muffled pipes while the car is running. Remember the first time you saw an R8? Your reaction was probably something along the lines of, “what is THAT?” Well, same for us. Under part throttle and idle, valves route exhaust gasses through a central muffler, keeping sound tame and drone free. At 3/4 throttle application and more, the valves open and the system is unleashed – going into “straight pipe” mode. An in-cabin mounted electronic SwitchPath™ Remote toggles the mechanical valves between “normal” and “straight pipe mode.” Practical. Do you find our R8 4.2L V8 SwitchPath™ Exhaust too docile for your tastes? 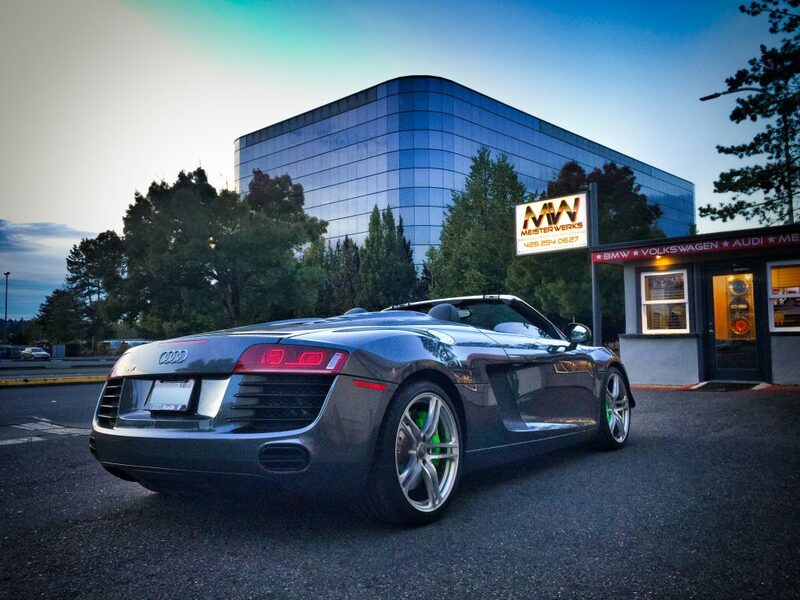 Meet the AWE Tuning AWE Tuning R8 4.2L Performance Straight Pipe Exhaust. This system unlocks the same impressive power gains of 25 hp and 28 ft-lbs as our SwitchPath™ Exhaust System, but sheds even more weight over the stock exhaust system, for a total weight loss of 50 lbs. Be warned, though: The sound from the straight pipes is not for the faint of heart, small children, or small pets, and there are no “switching options” available with this addition. AWE Tuning stands by this product with a lifetime warranty, however, the straight pipes cannot be returned or exchanged based upon sound satisfaction. Please note that due to the elimination of catalytic converters, this exhaust is legal only for racing vehicles which may never be used upon a highway. If you have an R8 4.2L and you’re looking to make one of the most meaningful evolutions available, this is your move. The Audi S5 is the high-performance variant of Audi‘s A5. It is also the coupé, cabriolet, and five-door fastback versions of the fourth-generation (B8) Audi S4 saloon and estate models. Like all Audi “S” cars, they are only available as standard with Audi’s quattro four-wheel drive (4WD) system, here in S5 using aTorsen-based centre diff system. Most versions of the S5 are manufactured at Audi’s plant in Ingolstadt, Germany; they are available as a coupé, cabriolet, and five-door sportback, which was previously not available in North America until the 2018 model year, which was released in the United States in mid 2017. The cabriolets are built at Audi’s factory in Neckarsulm, Germany. The Chassis in an S5 and A5 are different. The (B8.5/8.5T or Facelift) Audi S5 Coupé uses the 3.0 L Supercharged V6 TFSI engine producing 245 kW, previously used in the S5 Cabriolet and S4 Sedan/Avant since the 2010 model year. The other major change under the bonnet is the introduction of stop-start technology for better fuel efficiency. Audi claims an average fuel economy of 8.9 litres/100 km (compared to the current 12.6 litres/100 km in the V8 coupe and 10.7 litres/100 km in the Cabriolet). In 2017, Audi replaced the supercharged 333 HP engine with a single turbocharged 183 cu in, 2995 cc, 354 HP engine, an increase of 21 HP from the supercharged model. Although more powerful at low RPM, Audi made a decision to replace the supercharger with a turbocharger based on European driver’s preference for smaller, more efficient, yet powerful engines, a market which Mercedes and BMW have always lead. As part of the mid-generational refresh, the S5 undergoes some major front-end changes, including a complete redesign of the headlights – this means new LED DRL’s, a brand-new grille loosely based on the 2012 Audi A6 grille and new fog lamps. Audi has also introduced a new rear diffuser that appears to be more cosmetic than the one found on previous models and updated LED tail light design. Inside, the S5 receives some new features. Dials in the center console get the chrome treatment along with the edges of the buttons for the windows, 4 Audi MMI control buttons and Audi’s 3G+ MMI which has a slightly refreshed interface and now features Google Earth maps. Audi has brought the shift knob from the RS5 to the S5. There is a shift from having four buttons down each side of the console, to just two with the addition of a Menu and Car buttons below the MMI control dial (Audi has removed the skip forward / backward buttons that previously occupied the space on either side of the back button). Lastly, a flat-bottom steering wheel style will have a new circular airbag cover as well as piano black trim. The Audi R8 (Typ 42) is a mid-engine, 2-seater sports car, which uses Audi’s trademark quattro permanent all-wheel drive system. It was introduced by the German car manufacturer Audi AG in 2006. The car is exclusively designed, developed, and manufactured by Audi AG’s high performance private subsidiary company, Audi Sport GmbH (formerly quattro GmbH), and is based on the Lamborghini Gallardo platform. The fundamental construction of the R8 is based on the Audi Space Frame, and uses an aluminium monocoque which is built using space frame principles. The car is built by quattro GmbH in a newly renovated factory at Audi’s ‘aluminium site’ at Neckarsulm in Germany. In 2005, Audi announced that the name of the successful Audi R8 race car would be used for a new road car in 2007, the Audi R8, based on the Audi Le Mans quattro concept car (designed by Frank Lamberty and Julian Hoenig), appearing at the 2003International Geneva Motor Show, and 2003 Frankfurt International Motor Show. The R8 development program began in 2004, Lamberty’s design being approved and frozen for production. Production body prototypes began field testing in January 2006. The R8 road car was officially launched at the Paris Auto Show on 30 September 2006. There was some confusion with the name, which the car shares with the 24 Hours of Le Mans winning R8 Le Mans Prototype (LMP). 6-time 24 Hours of Le Mans winnerJacky Ickx described the R8 as “the best handling road car today”. BMW 750Li in for a BMW Repair / ABS brake module. 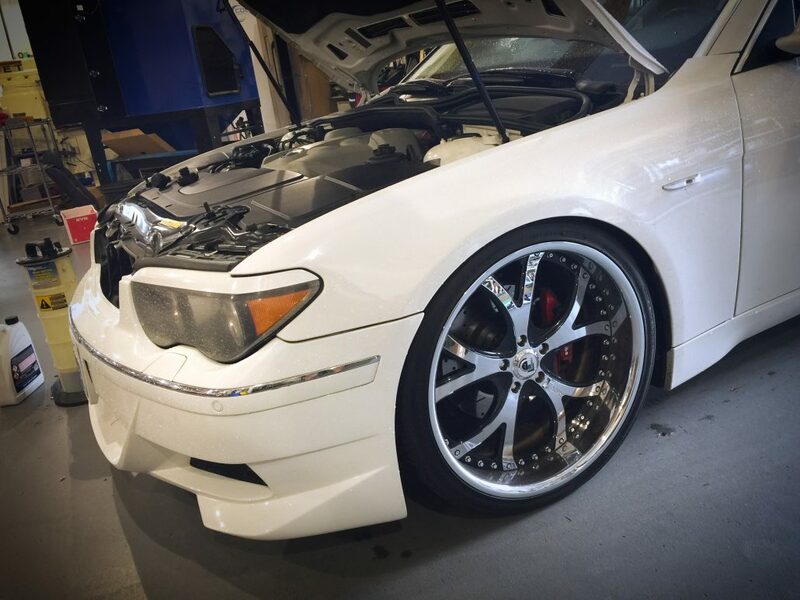 We can perform your BMW repair service and maintenance needs as well. – at Meister Werks Renton, WA 1 block south from The Landing. The BMW 7 Series is a full-size luxury sedan produced by the German automaker BMW since 1977. It is the successor to theBMW E3 “New Six” sedan and is currently in its sixth generation. The 7 Series is BMW’s flagship car and is only available as a sedan (including long wheelbase and limousine models). It traditionally introduces technologies and exterior design themes before they trickle down to other models in BMW’s lineup. The first generation 7 Series was powered by straight-6 petrol engines, and following generations have been powered by inline-4,straight-6, V8 and V12 engines with both natural aspiration and turbocharging. Since 1995, diesel engines have been included in the 7 Series range. Unlike the 3 Series and 5 Series sedans, BMW has not produced an M model for the 7 Series (ie an “M7”). However, in 2014 an “M Performance” option became available for the 7 Series. The E65/E66/E67/E68 is the fourth generation 7 Series, which was produced from 2001 to 2008. The model range consisted of standard length and long wheelbase (“Li” models) sedans. The E65/E66/E67/E68 was the first BMW to include iDrive, “flame-surfacing” exterior styling, active anti-roll bars, a 6-speed automatic transmission, an electronic Smart Key (dispensing with the traditional metallic key) and night vision. The 760i model was the world’s first production V12 engine to use direct injection. Each vehicle has a maintenance schedule, outlined in the owner’s manual. Be sure you read and understand the schedule. Items that require regular maintenance include the car’s fluids, tires, brakes, and filters. Oil and air filter changes are particularly important to keep the engine running efficiently. Did you know? These days experts say that you only need to change your oil every 5,000 miles (not every 3,000 miles like 10 – 15 years ago)? A good rule of thumb is: If the vehicle is a 2003 model or newer, it’s fine to change the oil every 5,000 miles.